So, a few weeks ago before I dropped off the face of the earth, before I ended up sick, and before I discovered what fascinating colors old chicken curry can turn, I had a little drawing to celebrate the 65th Marisole paper doll ever. A wonderful reader known as Kat won by drawing and was so kind as to send me the following guidelines for what sort of paper doll she would like to see for her prize. I was wondering if I could request a Puck doll. If so, I’d very much like to see him in a suit, so that he can take the gussied up Pixies to their soirees :). No real preference on the colors but I would like a boutonniere. Now, I’ve never been pleased with the Puck paper dolls, but I was willing to try to make some dapper Pucks for her, so I set to work and it took a lot longer then I thought it should, but sometimes these things do. 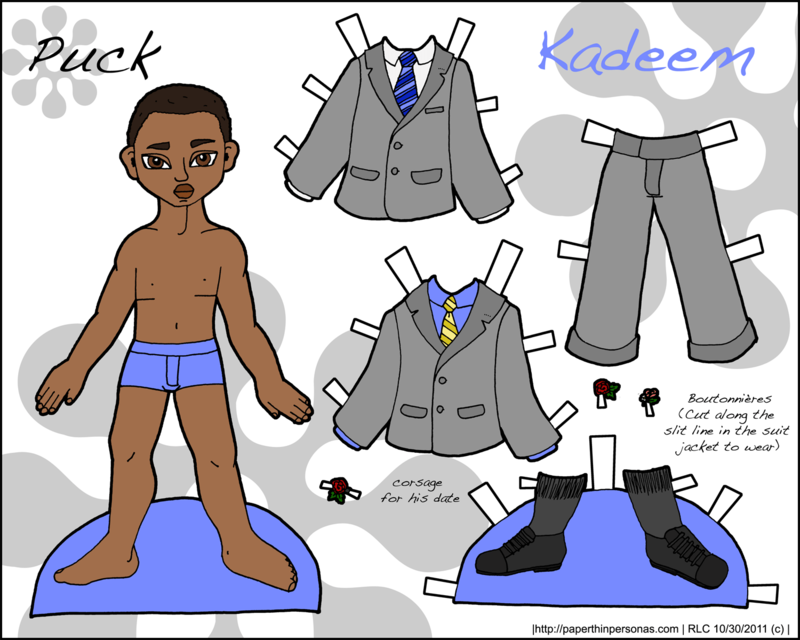 It might be a few weeks late, but I am proud to provide two puck paper dolls in stylish suits. The first is Kadeem who I think of as a modern young man heading out for a date, though I suppose in his clean cut suits he could also be heading to work or something else. He has two different boutonnieres and a corsage for his date. He’s joined by his good friend Gabriel, a slightly old fashioned gentleman, with a pair of black suits with red ties. Something about double breasted suits always makes me think of the noir movies, so I gave Gabriel an old fashioned hair style and shoes to go with it. 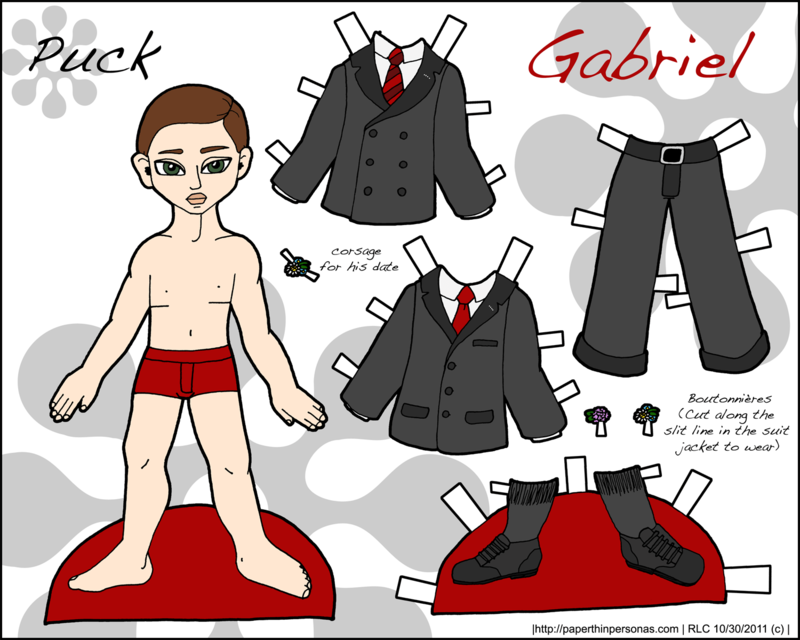 Gabriel, Gabe to his friends, also has two boutonnieres and a corsage. If you slit along the dotted line on the suit jackets, the gentleman can wear their boutonniere. I hope these guys were worth the wait, Kat and now any of the Puck paper dolls are ready for dates. Love maybe in the air. They’re adorable! Thank you. Sorry it took so long to comment. Homework can be a pain. I’m so glad you like them and I sympathize about homework. It took a long time for me to finish them up, but I was pleased with how they came out.